First, divide the whole chicken breast in two and remove any left over bones. 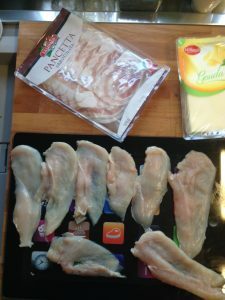 Slice each part in the thin long slices, the thinner the chicken will be it will be easier to roll it. If you can’t slice it super thin, you can always level it up with the good old kitchen mallet. 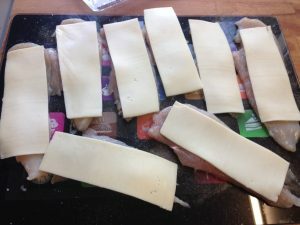 As the cheese slices were wider than my chicken, I have cut them in half length wise. Roll the chicken making sure cheese stays inside as much as it can. Place the rolls on a plate making sure that they don’t unroll. 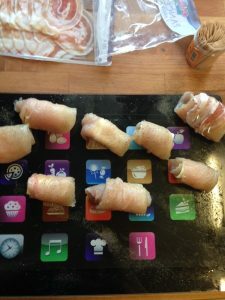 Take the bacon slices (I have used thin sliced pancetta to do it) and wrap it gently around the chicken making sure that you cover it all around. Use toothpick to keep it stay in one place. In your frying pan add 3 tablespoons of extra virgin olive oil, a spoonful of butter and several leaves of fresh sage. 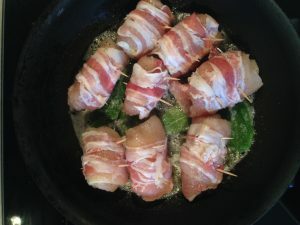 Let the butter melt slowly and then add your bacon wrapped chicken. 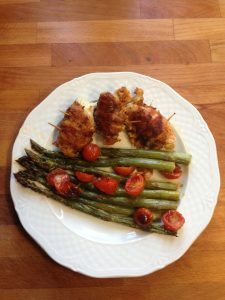 Fry the chicken on low heat from all sides until it gets golden brown. 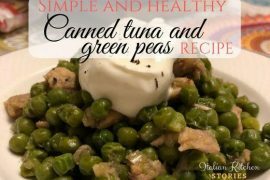 Serve with vegetables of your choice. I have made some baked asparagus to serve it with.